In her first Sunday talk show appearance since her use of Benghazi “talking points” set off a political firestorm in 2012, National Security Adviser Susan Rice was asked point-blank whether she has any regrets about her involvement in informing the public of developments regarding the violence before, during and after the attacks on a U.S. post in Libya. He noted that many believe the controversy over the accuracy of Rice's talking points cost her a chance at becoming secretary of state. “This information I provided, which I explained to you, which was what we had at the moment, it could change,” Rice said. “I commented this was based on what we knew on that morning was provided to me and my colleagues and Congress, by the intelligence community, and that's been well validated in many ways since. Susan Rice you ended up being a disgrace just as much as Loretto Lynch is. You should feel bad, both of you should ride the short yellow bus together . What a steaming sack of democrat this one is. lol i find it amusing people are still riled up about this on the right. Just for the simple fact of the hand they had in thousands of soldiers dying or coming home gravely wounded, due to lies perpetuated by the Bush admin (and its well known). Along with the cover up and use of Pat Tillmans death as propaganda for their illegal war! But hey, "Benghazi!!" right hypocrites? If you would only fly back to this planet. So 4 dedicated Americans died, possibly for no reason, obandon and his merry court jesters lie about it, and to this day still do, and you don't care or want to know what happened. Mr. Transparent is not only the worst president in the history of the world whomever he is doing the bidding for should be prosecuted for what they are doing to the American people. 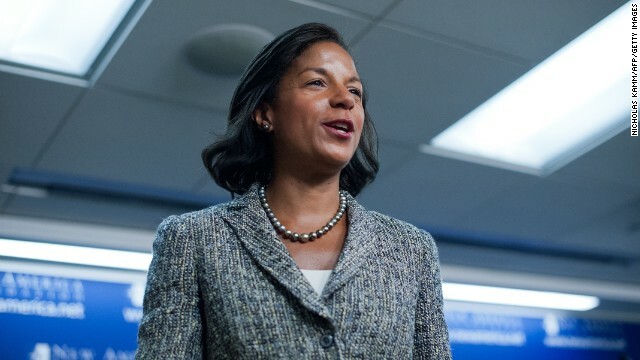 Ms. Rice, a truly remarkable woman – a woman of great talent, articulate, educated and totally devoid of common-sense. Again, to go before the public (no matter how benign and friendly the media outlet is), and to repeat, essentially that which she said before, ignoring that it was essentially 100% discounted as to truthfulness, veracity, honesty and above all no apology for "anything", is truly, truly a remarkable thing to do. I applaud her for being a "brave face, and 100% Obama Supporter and "true disciple" and foot soldier (too the bitter end). But she should "get out more". I mean outside of the White House, Beltway and away from WDC in general. Take a trip and see what the folks actually think out in "fly-over" country – and how she is "actually" perceived to be. I believe she would be just a bit disappointed in the results of her trip. Buckwheat told her to lie. She did. Repeatedly. lol nice racist term..apparently, its ok for Condie rice to lie about faux WMD's in Iraq, and Pat Tillmans death for MONTHS! But Susan Rice reads the wrong thing once, and shes to blame? lol and there in lies the hypocrisy that is the GOP. Oh, Pats family is STILL waiting for answers too! but never mind that right, "Benghazi!" To those who keep bringing up Benghazi, the place never meant a thing (none knew where it was and probably still don't), but simply another "tool" in repeated failed Republican attempts to discredit the President, no matter what the consequences for the nation. Not different from those who support Snowden. What a horrible woman, a horrible administration and a horrible President. Nothing in the pledge about obeying the government. It's called pride in your country and for many people that sing our anthem or recite our pledge of allegiance, we do so with respect for those that gave their lives so that we may have freedom. This country may have many flaws and has made a lot of mistakes, however for those that are truly grateful to have been born here, it is a humbling and proud act to recite or sing something that has so much meaning. Though wars have been fought, American lives have been lost we as Americans do stand United if for only one thing. Our Country is the greatest on earth and we will give our lives defending it and for other Americans. terrorism was on the run. Could not have anything interrupt the narrative that had already been put out. I ask you how many more of our next generations of finest youths will somehow be coerced and convinced or ordered by leaders of nations, movements and religions to sacrifice their precious lives in war? How many more will it be? Will it be many millions more or could it be none? Do you possess the answers? Our definition of democracy determines this to be true. My focused sight flashes me back again. past fire and ashes in a Mekong morning. cradles a still, slender woman. no longer shrouds her staring eyes now aglow. at her infectious, triumphant pyre. I did not break my stride.